After failing to bring home any wins over their last couple of games, the boys soccer team came back with a bang beating Los Gatos 3-1. The last time they played the cats, they tied 0-0, missing a penalty shot that could have secured the game. However, this tie only motivated them to come back out ten times harder the next game. The first half started off slow; no one was really able to get near the goal and the ball kept traveling back and forth through headers down the middle of the field. I could not tell you what was more distracting, the rapid application of foul calls or the quick changes of possessions on the ball. Regardless, the referee giving a yellow card to Eric Aboytes(‘19) set the cats up to put numbers on the board. Using the penalty kick to their advantage, they took the lead, finally scoring on Jackson Druker (‘20) who was on fire this game. However, the second half was another story. 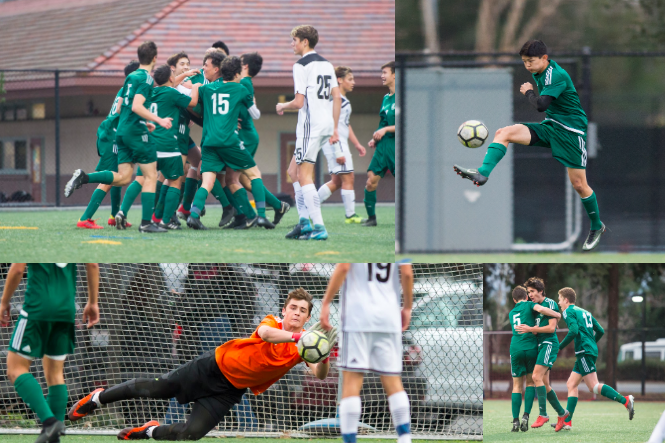 Paly came in hot, with Marc Essindi(‘20), Marcus Ama(‘20), and Kenzo Morabia(‘19) all scoring goals. “You know I had really been waiting for a game like this, and I am just glad that the team is finally back and ready to win”Ama said. Although the offense was doing amazing this game, the Vikings could not have taken this win without Nathan Seto (‘19), Juan Aguila(‘19), and Aidan Chueh(‘20). The defensive end was working their tails off all throughout the game, ensuring no more goals could be scored on them. “We really came together this game, and I think this win only boosted our confidence more for the next ones” Ilan Toussieh(‘20) said. Things are finally looking uphill for the Vikings from here. After some devastating losses the team finally seems to be back where they started this season and in good shape.